In a business or department, a manager evaluation determines if their head or person in charge is doing what is expected in his or her role and to other employees; an assessment tool that can point out what are the weaknesses and strengths of the managing skills of a manager, if Sample Evaluation Template every task given to them is accomplished well and if the expectations to them are met or not. The has the preferred downloadable format that they can access easily for them to use the survey to say the things they have observed in their manager as head and a coworker. The manager evaluation can help any manager in improving their attitudes and skills in their role to achieve the assignments given to them. 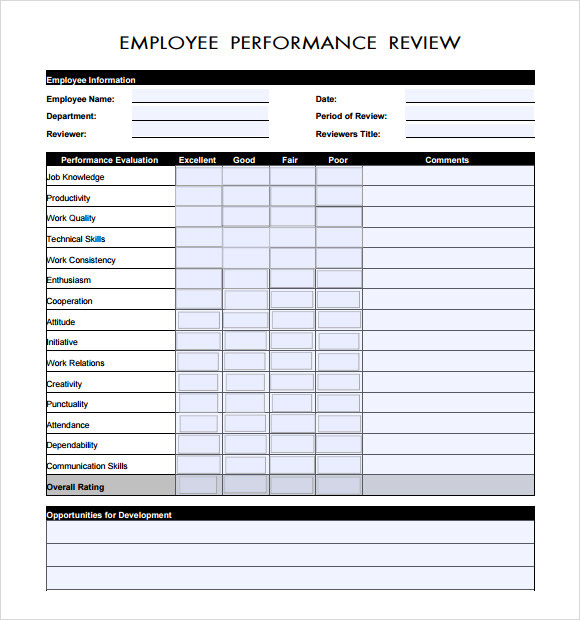 The employee review document template can be used for evaluating the performance of the employees. The key areas included in this template are problem solving, communication, customer service and entrepreneurship. The template also includes separate sections for reporting the goals of development and the strengths. 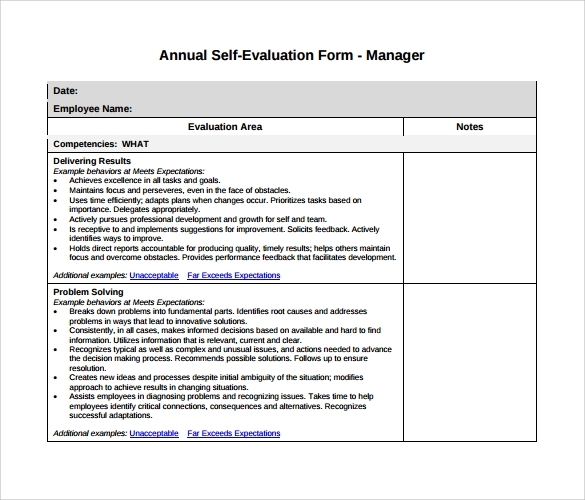 The manager evaluation sample template can be used in the form of a handy tool for carrying out the entire performance evaluation procedure customized as per the organization. It can help in coming up with a suggested procedure for conducting the evaluations. 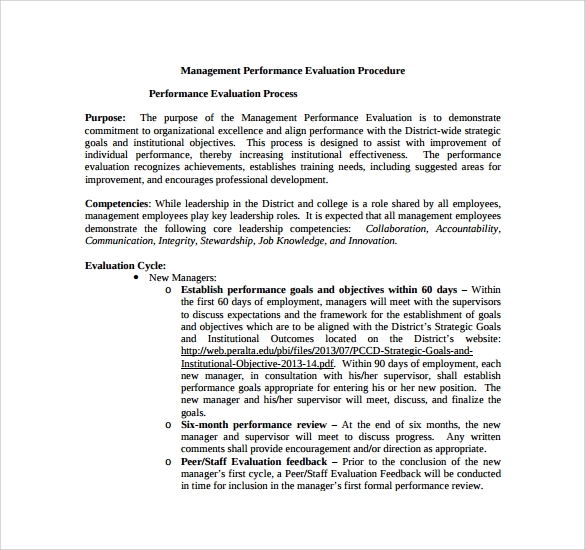 The management evaluation procedures template includes different evaluation procedures used by the management for getting a complete picture of the employees. This template is created by experts and works in rendering the best picture. 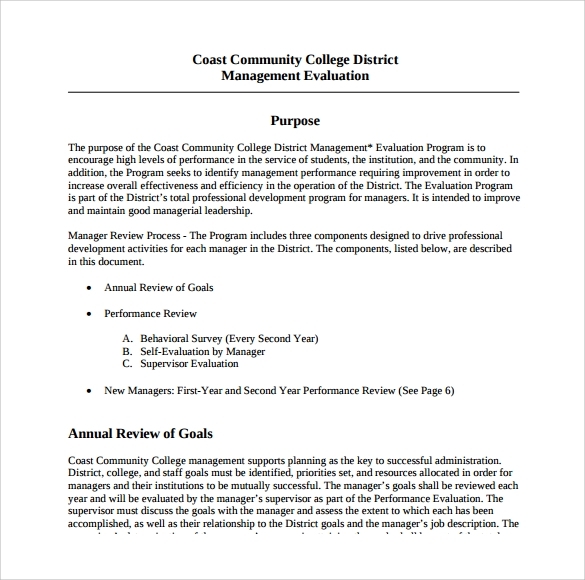 The performance evaluation template for managers serves as a handy evaluation result recording tool that helps managers in having real time data during discussions without the need of creating special layouts. Why Do Companies Need Management Evaluation Templates? It is always very important for companies to evaluate the performance of their employees. This should be done for the sake of business. Evaluation is something that should not be carried out just once but it should be a continuous procedure. Employee and management interactions need to be regular and consistent. If the management is aware of the strength and the talent skills of the employees, it can motivate the employees towards improving in their respective areas. The management in different companies can use management evaluation templates for evaluating the performance of its employees and for making necessary changes. When Do Companies Need Management Evaluation Templates? What Are the Benefits of Management Evaluation Templates? The performance review procedure that is carried out in every company is quite important. It helps in ensuring the success of the organization or the company and at the same time also helps in motivating the employees. The performance evaluation procedure of a company can be handled in the most effective manner by making use of management evaluation templates. 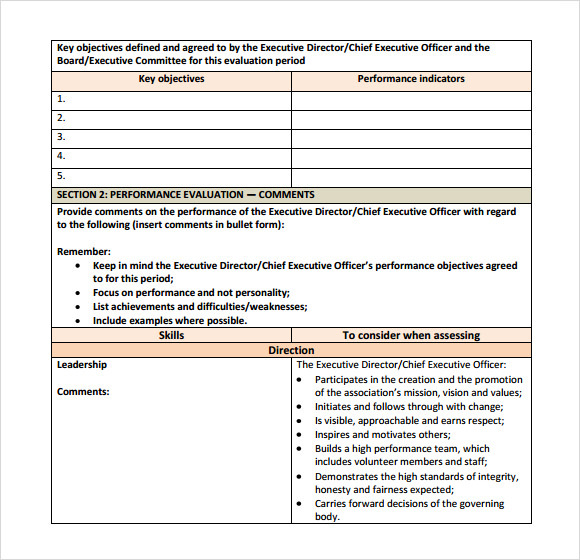 These templates are of good use in evaluating the staff members and even the managers working for a company. One major benefit of using these templates is that everything that you require is already there in the template. 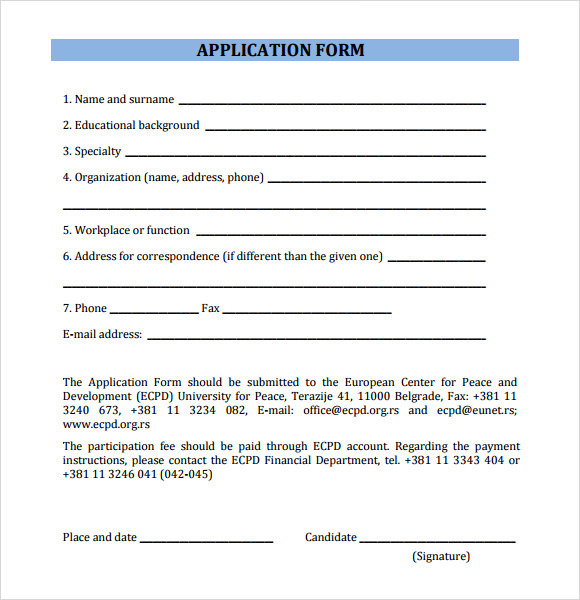 These templates can also be modified as the requirements of organizations. They can easily be downloaded and even edited for the performance evaluation of the employees working in an organization.